Special Counsel Robert Muller arrived at his office in Washington Thursday. Occasionally my editor here will mention the Mueller report in a meeting or on a call, and it immediately puts me in a nervous state. My hands get shaky, and I presume that she knows something the rest of us don’t. “Is it happening? When ... Today … Tomorrow … WHEN?” I can hear my voice, breathless with anticipation. “Oh, I have no idea. No one does,” she clarifies. All any of us knows is that some kind of report is coming. Likely soon, since the lead investigators have begun stepping away to take jobs elsewhere, a move that isn’t likely to occur until the report is all but finalized. I calm down slightly, but I’ve blown my own cover, outed myself as a political junkie having no chill these days, especially as it relates to the most anticipated Special Counsel investigation of our time. All the while, it is literally my job to deal in matters of balance, of the mind/body variety. Who has been charged so far in the Mueller investigation? Multiple individuals have been charged in special counsel Robert Mueller’s ongoing investigation. Has anyone told Rebecca she should try yoga? I imagine the whispers. Does this sound familiar? If you suffer from heart palpitations, loss of sleep, jittery conversations with friends and colleagues, a sinking suspicion that you should set an alarm at 2 a.m. just to check Twitter — all at the mere mention of a name that none of us knew how to pronounce initially — rest assured, you are not alone. This is what it means to suffer from a nationwide epidemic I’ll call AMRA: Anticipatory Mueller Related Anxiety. For which there is only one cure: the release of the report, in whatever form it will ultimately take. The anxiety feels like it’s gotten worse in recent days, as the Washington buzz machine has cranked up. 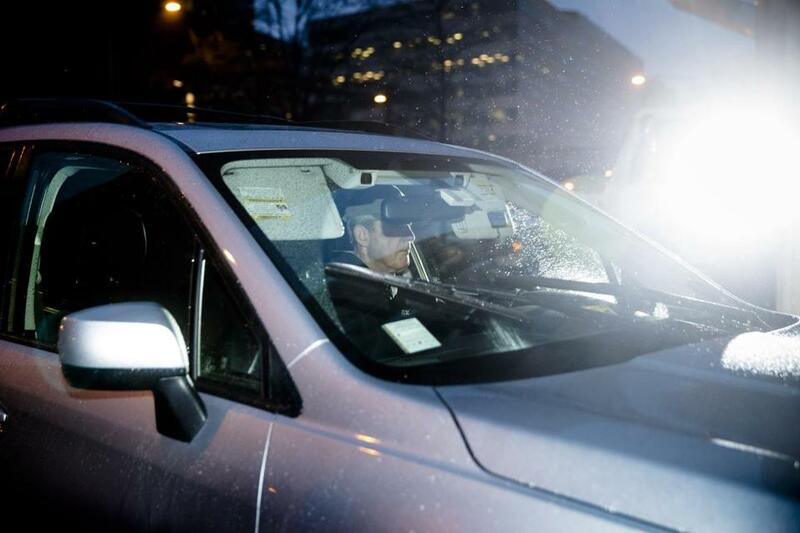 On Thursday morning, the Associated Press staked out Robert Mueller himself, photographing him in the rain as he pulled his car into work (see photo). We can’t predict when it will come, or how long it will be, but we can brace ourselves and manage symptoms with the following techniques in the days ahead. Some reports say two weeks at most, but, shhh, be cool. Of course it bears mentioning that while my political heart palpitations here are mostly for effect, the wellness advice is sound and widely applicable. First, we must breathe. I recommend a technique called equal breathing. You breathe deeply and slowly, matching your inhalations and exhalations. You will need to count the length of your inhale and coordinate the exhale. Definitely don’t try to estimate the hours until the Mueller Report arrives. That will worsen symptoms. If you consider the possibility that the public may not even see the report, your head could explode. One useful mantra when stress escalates is what’s often called, “This Too.” The theory behind mindfulness is that daily life offers all the opportunities we need to practice. When we feel anxious, we haven’t screwed up. We’re not defunct meditators or bad yogis or hapless head cases. We’re human beings. We occasionally need to be reminded that “this too” is part of the journey — whatever our “this too” situation entails, including political or personal conflict. Have you tried acupuncture? It’s traditional Chinese medicine, which removes energetic blockages within the body. You can think of these blockages as obstructions of justice. It’s important not to scrimp on exercise when you’re dealing with mounting emotional stress, to find some semblance of healthy routine when, for example, the president is being investigated for the possibility of colluding with a foreign power to sway an election. But you don’t need it recounted here. Go for a walk or run. (Imagine sprinting to the polls in 2020 if you need to). Take advantage of this week’s spring thaw. Leave your phone at home for a change. We need to remember to do what we can to preserve our heart health, cardiovascularly and otherwise. Or we can pick up a book. It’s one of my favorite mindfulness activities, an accessible remedy for distraction and a nice break for our screen-strained eyes to boot. I interchange between novels, memoirs, and nonfiction related to my field or, lately, social justice. Finally: we meditate. It’s a proven way to reduce stress and refresh our minds. It doesn’t need to be complicated or prescribed. Simply sit comfortably and pay attention to your breath. Thoughts will come. Thoughts will go. You can acknowledge them and let them dissipate. Do your best to stay present. Try not to let your mind cast the movie of this investigation. That would be counterproductive. Also, George Clooney will play Mueller. It will no doubt be a box office smash political thriller. Now, if we only knew how it ends.